I can recall going to my grandma’s farm during the summer months as a young girl. She would always have something tasty baking in the oven. One of my favorite things that she would make was rhubarb crisp. I think the part that intrigued me the most about this recipe is that grandma would pick the rhubarb right out of her yard. It grew wild in patches next to the barn. I would usually get to be the one who harvested the rhubarb. It always amazed me that one minute the rhubarb was growing outside grandma’s house and the next minute it was baked into a delicious crisp. Yum! I hope you enjoy this rhubarb crisp recipe as much as I do! Preheat your oven to 400 degrees, grease a casserole dish and set aside. In a large bowl, toss together the rhubarb with the sugar and flour. Put this mixture into your casserole dish and set aside. In the same bowl, add all the topping ingredients except for the butter. Mix the ingredients so that they are combined, add the butter and using a fork or a pastry cutter, cut in the pieces of butter so that you have a coarse mixture. Scatter the topping all over the top of the filling, place the casserole dish on a baking dish and bake the crisp for about 40 to 45 minutes or until golden brown and crispy on top and the filling is nice and bubbly! 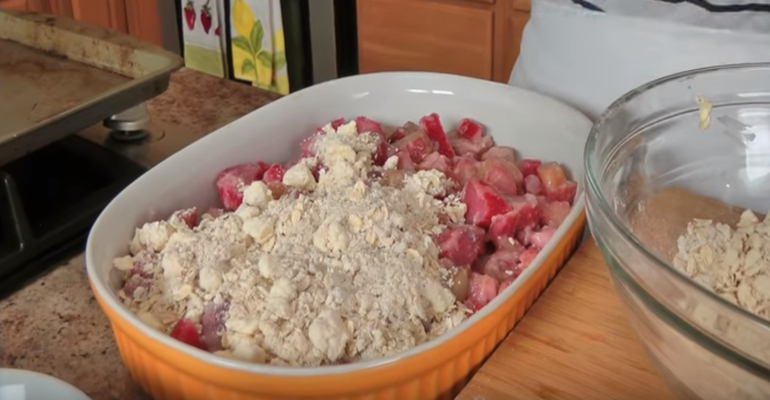 Thank you to Laura in the Kitchen and YouTube for this amazing rhubarb crisp recipe and video. Quick Tip: Serve this delicious rhubarb crisp with your favorite ice cream.